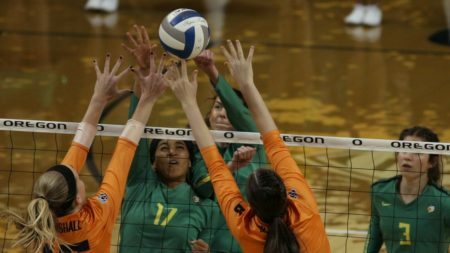 The Oregon Ducks opened Pac-12 play with a three set sweep (25-14, 25-23, 25-19) of their rivals from Corvallis Tuesday evening at Matthew Knight Arena. It was the seventh straight win for the Ducks and featured a timely new addition to the attack, sophomore outside hitter Jolie Rasmussen. With a delayed start to her season thanks to injury, Rasmussen has been playing “catch-up” to her teammates in terms of conditioning and playing time. With a team leading 12 kills, Rasmussen was the “best she’s looked ever in an Oregon uniform” according to head coach Matt Ulmer. Lindsey Vander Weide matched Rasmussen’s dozen and Willow Johnson added 10 to give the Ducks three players with double digit kills. Haylie Bennet was high for the Beavers with nine. As a team, Oregon held a sizable advantage, 55-34. The Ducks out-hit OSU .395 to .179. Midway into the first set Oregon strung together a series of points to turn a 9-7 match into a 21-12 match and finished the set with four straight points. 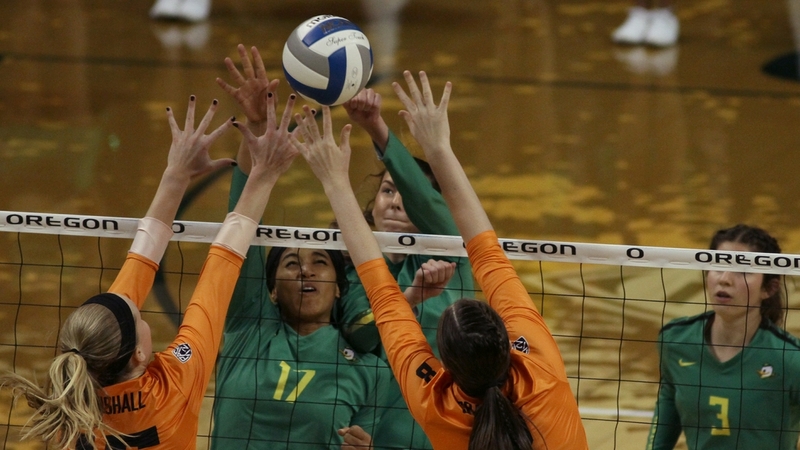 Set two was a more back-and-forth affair with the Beavers holding a lead as late as 23-22. A kill by Johnson, a Beaver service error and Rasmussen’s service ace let the Ducks slip the hook. With a commanding 2-0 lead, the third set appeared to be following the pattern of set one with the Ducks breaking ahead to 20-11 lead. Six straight Oregon State points changed the mood for a moment but a pair of service errors ended the threat and the Ducks outscored the Beavers 5-2 down the stretch to complete the sweep. With Rasmussen back into the mix, Ulmer is probably right but that doesn’t make the road ahead any less daunting. A three game road trip awaits – UCLA, Utah, Colorado – before the Ducks return to host defending national champion Stanford on Friday, October 6th. ESPNU will provide coverage beginning at 8:00 pm.